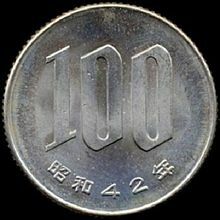 The 100 yen coin (百円硬貨, Hyaku-en kōka) is a denomination of Japanese yen. The current design was first minted in silver in 1959 and saw a change of metal in 1967. It is the second-highest denomination coin in Japan after the 500 yen coin. The first 100 yen coin was issued in 1957 and featured a phoenix on the reverse. It featured Latin script writing in addition to Japanese. This design was issued in 1957 and in 1958. In 1959, the design was modified, removing the Latin script, and changing the reverse side to show a sheaf of rice. The metallurgy remained unchanged. This design was issued every year from 1959 to 1966. The current design for the 100 Yen coin was first issued in 1967. The metallurgy was changed from the former 60-30-10 ratio of silver-copper-zinc to a ratio of 75-25 copper-nickel, with the weight and diameter of the coin unchanged. The reverse side was changed to show sakura blossoms and the denomination in Japanese. The coin shares, with the 50 yen coin, the emperor's rule date (28 in 2016) expressed with Arabic numerals instead of in Japanese numerals. The following are circulation dates which cover Emperor Hirohito's reign. The dates below correspond with the 32nd to the 64th year (last) of his reign. One hundred yen coins had three main different designs, but there was no overlap in mintage between them. Coins for this period will all begin with the Japanese symbol 昭和 (Showa). "Emperors name" → "Number representing year of reign" → "Year" (Ex: 昭和 → 53 → 年). The following are circulation dates in the reign of the current Emperor. Akihito was crowned in 1989, which is marked with a 元 symbol on the coin as a one year type. Coins for this period all begin with the Japanese symbol 平成 (Heisei). "Emperors name" → "Number representing year of reign" → "Year" (Ex: 平成 → 16 → 年). Heisei[b] 2015 2,324,000[c] 50th Anniversary of the inauguration of the Tōkaidō Shinkansen train service. ^ These coins came in a set of four, and all have a different obverse. The reverse side of the coin is shown in the picture. ^ "Operations Coins Currently Minted: Japan Mint". Japan Mint. Archived from the original on 18 October 2009. Retrieved 20 July 2010. ^ a b c "年銘別貨幣製造枚数" (PDF) (in Japanese). Japan Mint. Retrieved March 25, 2019. ^ "Reiwa coins to debut summer 2019". ^ "Japan 100 Yen Y# 79 Yr.39/1964". Numismatic Guaranty Corporation. Retrieved April 1, 2019. ^ "Japan 100 Yen Y# 83 Yr.45(1970)". Numismatic Guaranty Corporation. Retrieved April 1, 2019. ^ "Japan 100 Yen Y# 84 Yr.47/1972". Numismatic Guaranty Corporation. Retrieved April 1, 2019. ^ "Japan 100 Yen Y# 85 Yr.50(1975)". Numismatic Guaranty Corporation. Retrieved April 1, 2019. ^ "Japan 100 Yen Y# 86 Yr.51(1976)". Numismatic Guaranty Corporation. Retrieved April 1, 2019. ^ The Tōkaidō Shinkansen commemorative coin series (Tōkaidō Shinkansen N700A) Japan Mint (www.mint.go.jp). Retrieved on 2017-10-05. ^ Designs of The Olympic and Paralympic Games Tokyo 2020 Commemorative Coin Program (First Issue) The Ministry of Finance of Japan (www.mof.go.jp). Retrieved on 2018-03-03. ^ Designs of The Olympic and Paralympic Games Tokyo 2020 Commemorative Coin Program (Second Issue) The Ministry of Finance of Japan (www.mof.go.jp). Retrieved on 2019-01-10. Wikimedia Commons has media related to 100 yen coins.